The recipe and a lot more picture below. This dough is a wonderful one from Beth Hensperger's The Bread Bible. I like it because it is sweet and rich without being too rich. Any sweet dough will do though. Hensperger suggests making a raspberry filling and sprinkling a streusal on top instead of using egg wash. That, too, sounds excellent, I just happened to have a bunch of extra blueberries in the freezer and some extra cream cheese in the fridge so I modified the recipe to fit my needs. Obviously, you should adapt this to use whatever you enjoy the most, have easy access to, or have an excess of. Oh. I am sooo making this tomorrow. :) That looks great, Floyd! 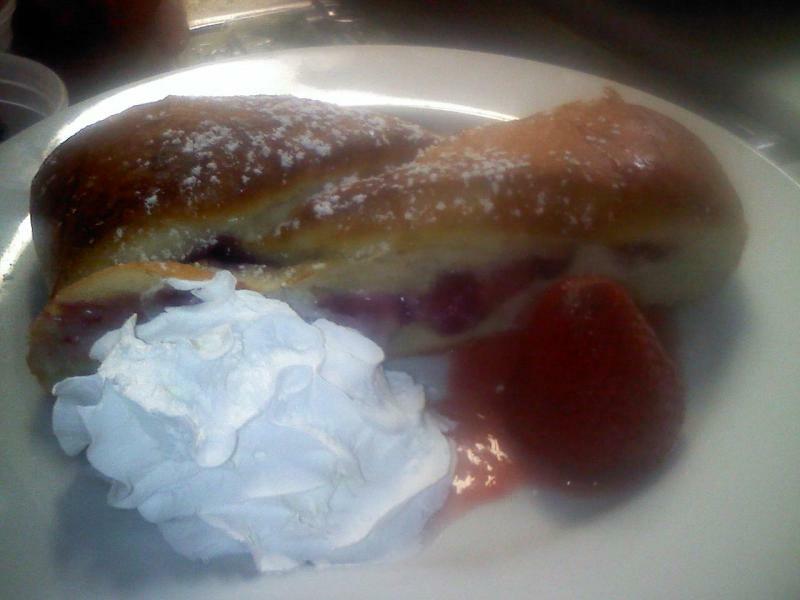 I wonder how it would taste with fresh boysenberries and cream cheese? I think I'll try that and report back. On one, I followed your recipe exactly (cause' the hubby wanted blueberries). On the second one, I did a mixture of gold-raspberries, orange zest and juice (instead of lemon), and a shot of Bacardi Rum. :) It smells absolutely wonderful. If you get any good snaps, post them in the forums. It looks like you figured out how to post images. In case anyone else is wondering, there is an answer in the FAQ. I made this formula this past weekend and it turned out very well. Also the intructions were easy to follow. If you have haven't tried it, you have to do so! Variations are now crossing my mind... the dough could be used for cinnamon rolls or maybe sticky buns. Perhaps diced cooked apples in autumn. Or maybe persimmons? There was a fermentation lesson imbedded in the experience: The Twin Cities are having a heat wave and the ac could only do so much... Boy an 85 degree room will really pop the yeast! The doubling took only an hour. I was afraid that the fast rise might harm the flavor, but it was fine. Just another variant on the stuffing. In a small pot, combine; butter, brown sugar, and chopped walnuts. Stir until combined. Add apples, cinnamon, nutmeg, lemon juice, and corn starch. Combine and heat until you get a gooey concoction. :) The goal is to get the nuts a touch roasted...the apples will finish baking in the oven. 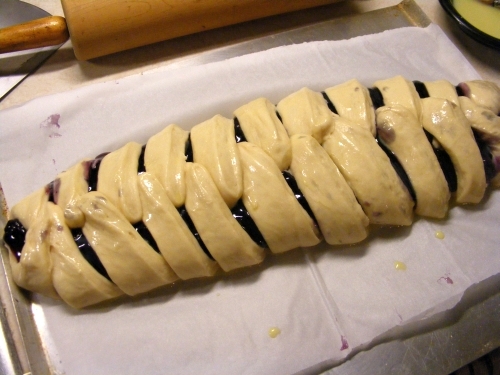 Just finished filling/braiding my blueberry cream cheese braid. This has been on my list of must-do breads for some time now. I used a mascarpone cheese filling with powdered sugar, vanilla and cinnamon, along with the blueberry filling. Added a little extra lemon because my Meyer lemon is so sweet. Also, a dash of the vanilla/citrus extract called fioria de sicilia was added to the blueberries. I'll post pictures when it comes out of the oven. Looks like I did my braids a little thinner than Floyd's and I'm afraid I may have put in too much filling. 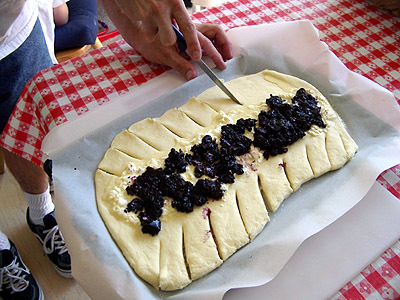 And the braid, blueberries and mascarpone!! This was my first attempt at a filled bread and boy did I learn many things! I made one braid recently but didn't realize that a slack dough would not work here until it was too late. My braid was disfigured as I transferred it from my work surface to the baking sheet for its final rise. I also forgot to let the cream cheese to come to room temperature so it remained as chunks even though I tried to melt it in the microwave. My mother described my finished loaf as Chinese BBQ pork because the egg wash created a very dark brown crust and my loaf looked like a monster. But I'll definitely try again; it tastes wonderful! I'll quarter the recipe next time since no one else wants to touch it (it's their loss) and bake for half the time. Thanks for the recipe! Costco sells 4 lb frozen bags of a mixture of blueberries, rasberries, and marionberries that is very cheap and came out great when I made this braid. I also use them with cereal after defrosting a handful in the microwave. There are a number of good recipes on this site that u can try but it would be better if u begin with the lessons. At the top of this site there is a menu, select the lesson option n u will open to the place where Floydm has elaborated step by step lessons on bread baking. 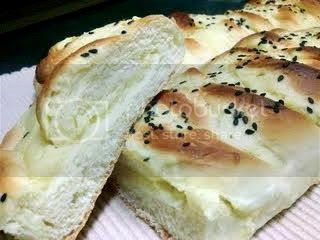 You can start with his bread recipe in the first lesson all quantities are given in detail. I can't find cream cheese can some one suggest a substitute. I have full cream(clotted) at home can it be used to make cream cheese. I saw on the Gourmetsleuth that I can substitute cream cheese by equal parts of Youghart and ricotta cheese. Since I make youghart everyday I dicided to use this substitute. Yesterday i made some ricotta cheese and youghart and right now both are draining in my fridge. So tonight I'll make the dough and in the morning will try the braid. :) Thanx for the advise. If you "google" you will see that cream cheese is made from milk. I do make butter and clarified butter which we call ghee but have not attempted ice-cream. i think the my son would love that, can u share a recipe. And this doesn't even call for an ice cream machine. 2 tablespoon brandy or rum optional, I didn't. crispy crumbs, pour into rigid container freeze until firm. Best eaten in about 3 day' or crumbs will go soft. It gives several possible substitutions for cream cheese. Maybe one or two would be available to you. Made it yet again to-day for my cafe, but this time I drizzled it with an icing flavoured with vanilla and cinnamon bark oil. Yummy and aromatic. Thanks again Floydm for your innovation. Anything else in your bag of tricks? I made this braid using cream cheese but my braid did not retain its shape and was flat(it was soft and nice never the less). I made one braid using only half of the dough & the rest half is sitting in the freezer. So for my next attempt I want to correct my mistake. Could it be because of too much of filling or could the filling be runny(ha whats that)I mean it had more liquid than needed. Since I had made cream cheese by mixing drained home made youghart and cottage/ricotta cheese it is possible that I might have not drained them sufficiently? Any idea what I did wrong? i have been making this bread several times now for the cafe so feel qualified to reply to you. Incidently I have reduced the amount of cornflour for the berry filling (using frozen blueberries) as it was seemed a bit too thick once the braid was baked. I wondered whether a well drained ricotta would give a thicker product, if you can get it. I have been using a thick ricotta to-day (in NZ) for a cannelloni filling and thought I would experiment to see whether it can be used instead of cream cheese, as it seemed to have a similar consistency. Was your drained yoghurt/cottage chhese/ ricotta mixture thick enough to support the braid before it was baked? The braid had started distroting while it was proofing and while baking it became quite flat. So I think that u can say that the mixure was not think enough. Some of it also oozed out during baking. Actually i spelled the word wrong its "distorting". it means to be mis-shaped or lost its original shape. While the braid was proofing it had stated expanding breadth wise insted of rising up thats why I got a flat braid. 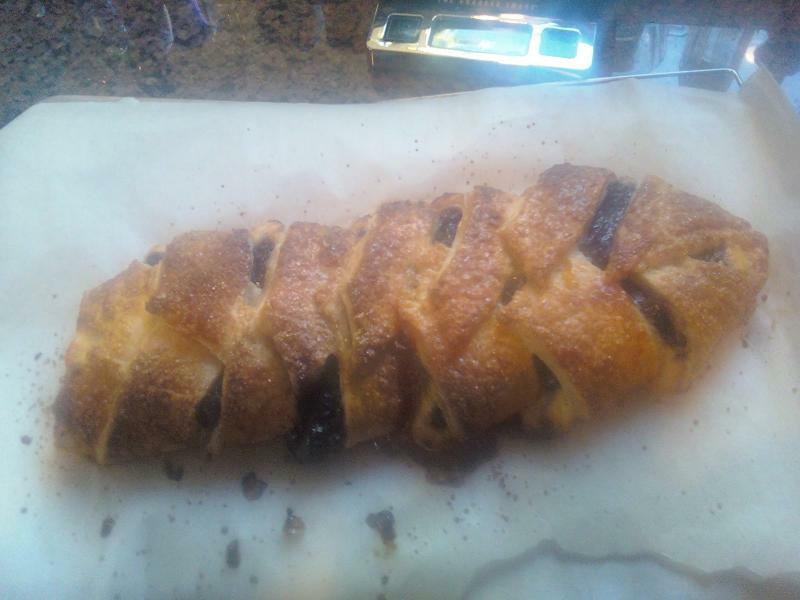 Yesterday I used the leftover half dought to make a chocolate braid with semi sweet dark chocolate . This time is rose beautifully and retained its shape and was soooooooooo chocolatey. So I think the first one was mis-shaped due to excessive filling or the filling being watery. Sounds that "all's well that ends well'. Great! 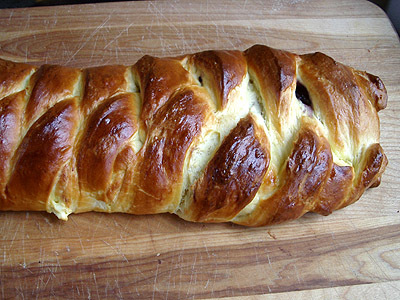 I will try out a chocolate centre next time that I will make the braid. I have a chocolate fudge recipe which I use as a centre for muffins ( a mixture of dark chocolate and cream) - can't remember the exact proportions - so thank you for the idea. Hi Melana, you were probably asking the above of Floyddm - but in the meantime I will add that the "thick sticky mess" of a filling is the best consistency to match that of the cream cheese and strong enough to support the weight of the braid top. I have found that by reducing the cornflour a little - a strong but slightly moister paste results. Floyddm, Thank you once again for this recipe which is more than ever popular in my cafe. I ran out of frozen blueberries so made the fruit filling by thickening Ocean Spray Whole Cranberry Sauce, and it was just as popular (and cheaper to make) as we export most of out blueberries to Japan now and the price of such is high on the domestic market. I'm going to HAVE to give this one a try. I don't care for blueberries by themselves but I absolutely LOVE them with cream cheese!!!!! If you are making 2 smaller braids I would increase the filling recipe by half again. If you find that you have some leftover, just refrigerate it and add it to the next filling you will make (because the braid is so nice). The filling keeps for at leat 3 weeks in the fridge. Because I make it now and then for my cafe, I always make a large quantity of filling (about 1 L) and have it on tap. I do add a little more lemon juice as the original recipe can be a bit gluggy. I haven't frozen any braids but can't see how the filling would be affected - just the brioche type dough would age a little. Just noticed some ambiguity in my above posting. I meant that the baked brioche type dough would age a bit with freezing, but a better idea would be to freeze the braid before the second proofing and later thaw and then let rise until it doubles in volume, then bake. I've made these now three different times in five weeks with terrific results. Many people are astonished at how wonderful the presenation is on these, and are amazed that I made them. One of the things I've been doing is experimenting with the filling. My fiver-year-old son loves blueberries, but my 11-year-old son hates them. The first batch was true to the receipe and wonderful. 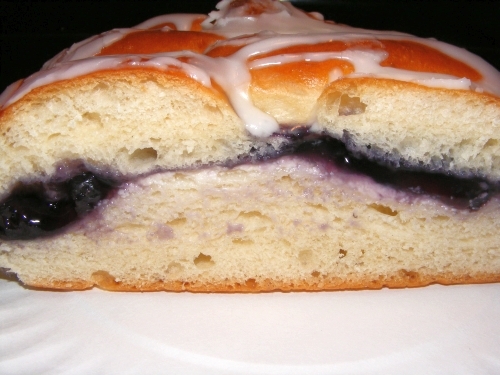 The second was made with a lemon pudding instead of blueberries. It was wonderful. The third was by far the best. I took one of the first ones to my parents and my dad loved it, though he doesn't care for blueberries either. He went into his cupboard and handed me a can of raspberry pie filling with strict instructions to make it the next time I saw him. I've been making two braids, and freezing one after I add the filling and do the braid. During the week, I take it out in the evening and let it thaw and raise to double and bake it. So far I've had no problems with that. Thanks again for this wonderful, simple yet fancy treat. Is it a must to refrigerate dough overnight, or can it just be left out to rise and bake the same day? It looks so good, I can hardly wait to bake it! i think this would work very well, but i'm certain it must be drained. I get artisan ricotta from the farmer's market and it is much much different than the kind at the store; it has a very clean, fresh and vibrant taste and a texture similar to what you get w/ the cream cheese/egg mix. I"m going to try it next time but I only had a little bit of ricotta left this week. YUm. 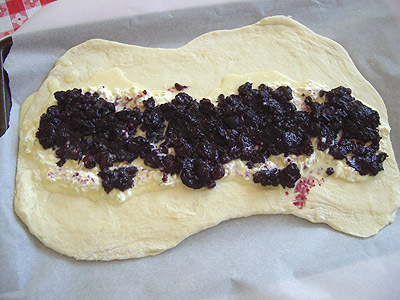 with a marzipan layer between dough and raspberries. That might make an interesting combination if the marzipan or almond paste is rolled out very thin. Would tend to soak up any excess juice too. I just happen to have everything and need a birthday treat for the weekend. I stumbled across "The Bread Bible" last week. It was lying on my kitchen table with a note, "Can you use this?" At first, I blinked, I hadn't had my coffee yet. I glanzed up to see if there was a hole in the roof. Could this be the BB some loafers makes reference (reverence) to? I soon discovered there are two books with the same title, different authors. I opened the book... all cups and no metric, so I'm not thrilled, but ever so often I pick it up to read. (I tend to start at the back of a book first...) There are hidden gems in the book, a few typos. It's a good book to start out on if you have a good imagination. Written discriptions are very good and just like most bibles there are no illustrations or pictures. 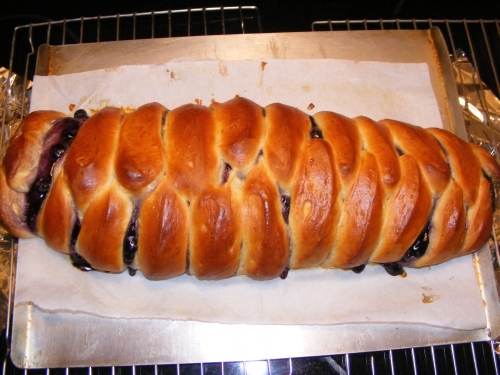 Last night I found the Blueberry Braid, actually a Maple-Blueberry Whole Wheat Braid (page 298, paperback 1999, author Beth Hensperger) where half the flour is whole wheat. Floyd, I like the changes you made in the recipe & the very helpfull photos too. Add another voice . . .
to the chorus praising this bread!. I made it for a family and friends brunch this Saturday and it got rave reviews. When boys in elementary school stop on their way out the door to say "Thanks for the awesome bread! ', it's about as good a compliment as a baker can get. Thanks again for posting the recipe, Floyd. I just made this last night with fresh peaches and cinnamon. I heated all this together until just warmed and combined. 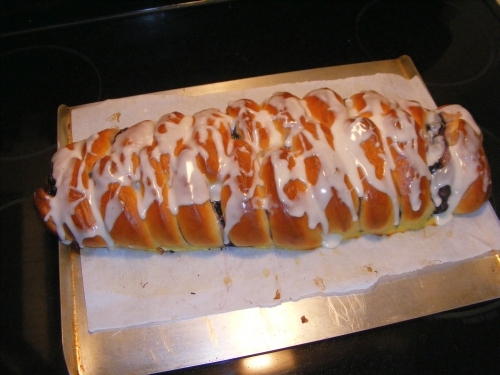 I also put a light glaze on this to pull all the sweetness together, just little sugar and cream drizzled on top. hmm did i mess up? My dough is taking a very long time to double. This is the first time I used my KA to mix everything. I was under five minutes mixing time on setting 2, but could I have overmixed it? Should I just wait it out or start over? I'm a big fan of lemon curd and modified the filling to add one tablespoon of lemon zest,three tablespoons of lemon juice, a couple tablespoons of mashed cottage cheese, and about a quarter cup of lemon curd to the cream cheese base. 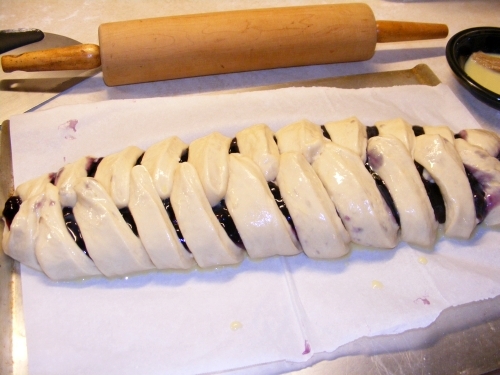 I topped this with fresh raspberries (prepared as in the original blueberry recipe)and added a ribbon of lemon curd on the top of the filling before folding the braid. I don't have photos, so you will just have to take my word for it....if you love lemon, as I do this is a must try variation. "Place the dough in a greased bowl, cover with plastic wrap, and let rise and room temperature until doubled in size, 1 1/2 to 2 hours. 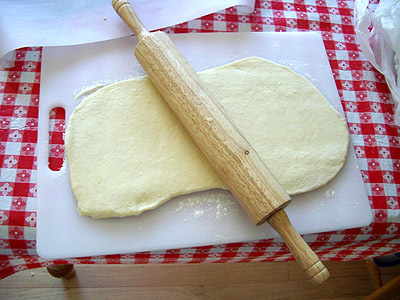 Deflate the dough, recover the bowl, and refrigerate overnight"
Is there a reason to refrigerate this dough overnight? 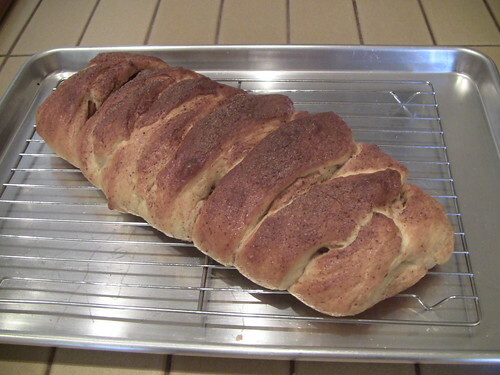 This braided bread also tastes great filled with cream cheese, sugar and pecans. You can also add some chopped prunes (softened) or dates. It really tastes great. In a mixing bowl, whisk the cream cheese, egg and sugar together till creamy. Stir cake flour till well combined. Add the milk, mixed well then using double boiler method, cook the mixture at medium heat till it thickens and bubble. Keep stirring constantly to get a smooth creamy texture. Remove from heat and sitr in lemon juice and butter. Let the custard cool then refrigerate it till needed. I skipped the cooking and mixed it up with the butter and lemon juice and added splashes of the milk beating with a mixer until I thought it the right consistency. 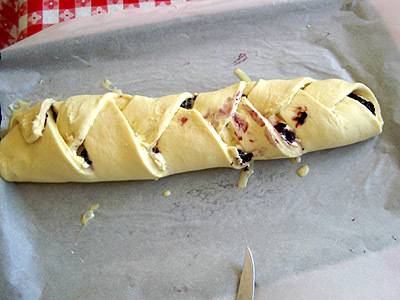 I spread it onto the dough and then added my berry filling. It bakes to a soft cake like filling which is excellent! I used half a recipe because I made only one braid. No runs! Dough for One Braid in Metric (conversion using metric cups where one cup water = 250g) See head of page directions. Any suggestions for converting this to a sourdough version? I am guessing longer proofing times but would like a guide. Thanks. I am enamored by this bread! One is blueberry cream cheese (I found frozen, organic blueberries at Costco) and the other is chocolate. Unbelievable! I didn't have lemon so I added a bit of almond extract to the cream cheese. Toasted sliced almonds and sprinked over blueberries (wild huckleberries actually). Loved the balance of flavors. These are just wonderful to look at, and will bet taste yummy too! However I am still having problems with pictures on these postings, half of them don't ever fill out, so am looking at the top 1/4 or less of a picture. 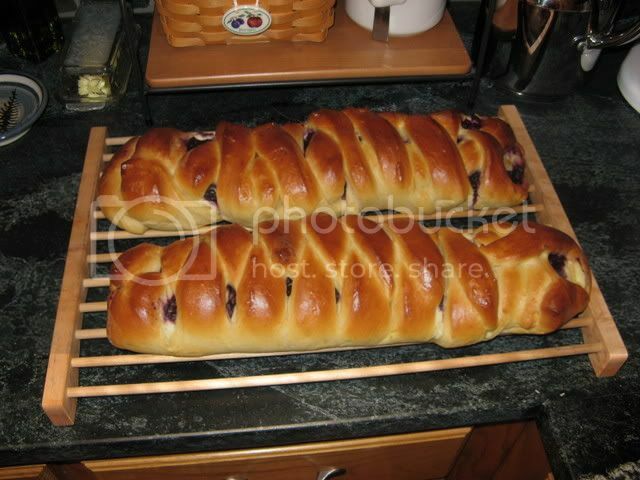 I can certainly see many braided loaves in my future, and will try all the fillings given, and any more I can dream up! Including fresh picked Saskatoons, which I can usually find easily on the road edges, and they are delicious, am not fond of blueberries, but do like huckleberries which also grow wild around here, will just have to try them all. Thanks for the lovely sites and the great breads! I had a chance to make this one as well. 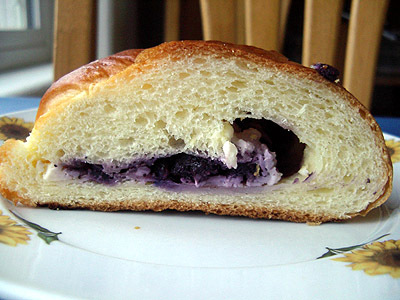 I substituted the blueberry filling for lemon. Overall I liked the flavour, I think I'd like an icing on top similar to danishes. Ooooh! Is that lemon curd? Ooooh! Is that lemon curd? That's a good idea! I know what to fix for my 3 grand daughters in two weeks when I go to visit---and I've got some time to practice the braid. Thnks, again, and it all looks so yummy. I would like to try this with the wild blackberries we have around here. The only thing I'm worried about is if the blackberrries will go bad in the bread. I've tried keeping them in the fridge before and in 24 hours, they're growing mold. I know they can be frozen, but do you guys think that after the blackberries are baked, they'd be OK in the bread for a couple days without going moldy? I don't bake with fruits very often and I'm not sure how baking affects them. My vine rarely gives me all ripe berries at the same time. As I pick them, I quickly wash them under running water and let them drip dry, then drop them into a plastic container in my freezer. When I have enough, I make dough for the braid. That way they don't get moldy. With a little sugar the cooked berries keep longer, also in the bread. I've never had a braid last longer than two days but if you wanted to stretch this out over a longer period, you might want to cut and freeze individual portions for later. This time of year, with the cool weather, a braid should last about 5 days covered with a towel in a cool room without any problems. 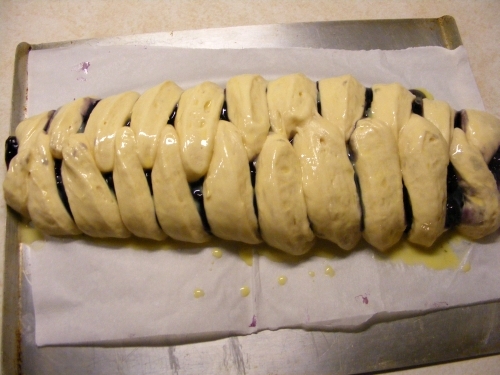 After having drooled over Floyd's Blueberry Cream Cheese Braid for a long time, I finally made it yesterday. I made half a batch and am glad I did. I would recommend at least 3 braids if you make a whole batch. The half batch was so big it was hanging of both ends of my 15" sheet pan. That being said, after breakfast this morning there is a big piece missing! It was great. The dough was too wet using my 120 gr/cup flour measuring, so I had to add quite a bit of flour (and I am no longer afraid of sticky dough, but this was thick batter). I mixed it in the bread machine using the dough cycle but didn't let it finish because the dough felt done. I used 1/2 of a 21 oz can of blueberry pile filling. Didn't do the overnight so I let the sponge ferment for a couple of hours and then mixed/kneaded the dough, let it more than double, then filled and shaped, rise again for about 45 min, then baked. Toppled with confectioners sugar (1 cup plus 1/4 t vanilla, 1 T milk) glaze after cooled. This makes a beatiful presentation and has so many options for fillings. I cannot wait to try some others. This is so much better than anything I ever bought in a store. Here is the braid after filling and shaping, ready to apply egg glaze. And here it is ready to bake. Crumb shot (makes me start drooling again. I saw this thread about a year ago and it has been on my list of interesting things to try. It was wonderful. The Family devoured it. I made this bread last week and brought to work. They all loved it. It's so yummy and rich without being too rich. I ran out of bread flour so I used the all-purpose flour instead. It worked well but I think bread flour would have helped the bread structure more and gave better gluten development. The bread still tasted nice nonetheless. 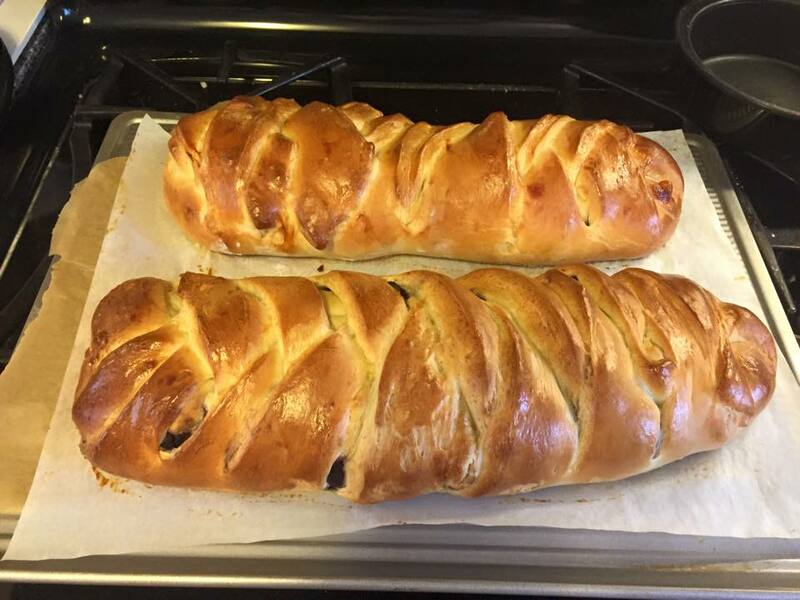 I reduced the recipe by half for one braid bake (and I forgot to reduce the egg wash amount in cream cheese filling, again, a minor disaster but it still worked). I also used frozen blueberries which again worked really well. Folks are still loving (and riffing on) this recipe. 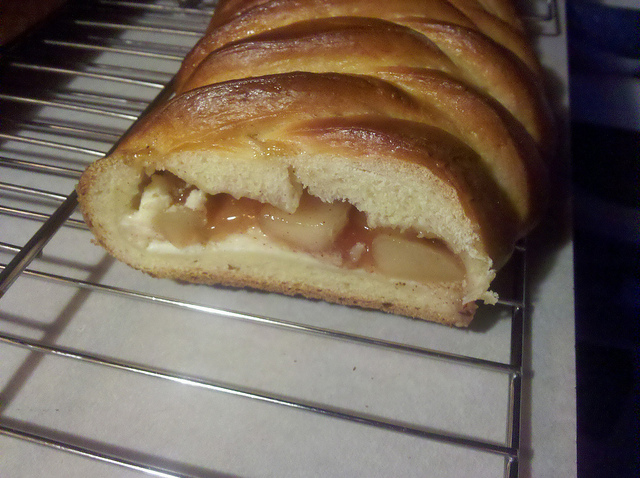 Here's my take, a Cinnamon-Apple-Cream Cheese Braid. Really Yummy. Thanks for starting this madness, Floyd. 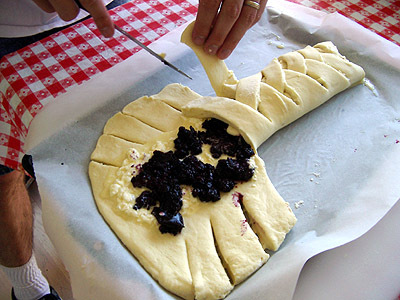 I am thinking it's about time I learn to braid my bread, and these pictures are sure making me hungry! I will be making a couple with fruit and cream cheese filling for a Christmas party at my husbands workplace. For many years now I have made a traditional Norwegian bread called Julekaka, and am thinking of making it into a braid just to see how it looks. I'll post a picture or two when I get them done, unless of course they end up in the "Ugly Loaves" thread! I made a cranberry braid today to take to a party. The fruit filling was 2 cups fresh cranberries + 1/2 cup sugar + 1/2 cup water. I forgot to add cornstarch, but since cranberries usually thicken up pretty well, it was ok. I boiled it for about 7 minutes and let it cool overnight before shaping the braid. Otherwise, I followed the recipe. It tastes great! This is a great recipe! 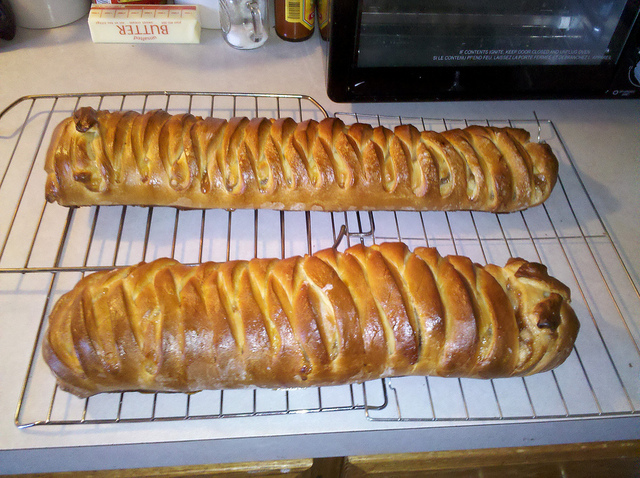 I actually doubled this recipe to make 4 braids, some for friends and some for a christmas party we went to. I found that the first two braids I made were hard to handle, because they were so large. I used these for the party, but I split the other half of the recipe into 4 smaller braids which worked much better for me. They turned out great and were a wonderful treat, since I prefer things that aren't quite so sweet and these weren't sickly sweet like donuts. I bought pie filling canned from the store, so I had apple, blueberry and cherry. Each can made 1 big braid, and 2 smaller braids, so I had leftover and when the original braids were gone I made another batch. First I changed the recipe just a little bit, by using a tablespoon of honey to my yeast/water at the beginning and then using splenda in the dough and cream cheese filling. This I made into 4 small braids again, stretching them lengthwise and using my baguette pan I was able to make long thin braids, and my french bread pan I made shorter thicker braids. In the last couple weeks I have also used the same method of braiding to make small pocket sandwiches. I have a supply of pepperoni pizza braids, made with whole wheat dough and ranch dressing (doesn't like tomato sauce) for my son. I have also used it to make hot dog & cheese sandwiches, plus mini braids for 2 to 3 pieces for my husband and myself. I have found that it works well for these and allows them to vent through the braids so it doesn't blow out the sides. I use the baguette pan and make two to three per section, so I can make 4 to 6 pretty easily.These are the original braids that were hard to handle, plus the pizza pocket sandwiches. I think I have pictures of the smaller ones, but can't find them right now. Can't tell you how much I love this recipe. It's always a huge hit. I made it for New Years day breakfast for my house guests. It was definitely the buffet favorite. I add my Thank You to the chorus, Floyd, for this recipe and for TFL. with home made puff paste. Sorry the picture is so poor. I will bake just about any desert and eat it faster. The lovely post made me want it badly but I had puff paste in the freezer and that was faster to filling the tummy. Speed won. 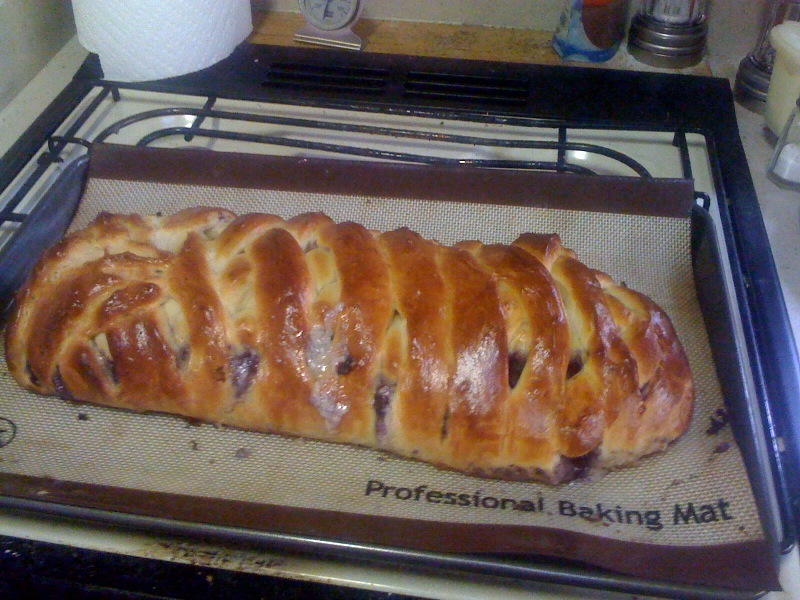 I made one loaf, half apples, half berries, to see which I want to make again for an upcoming visit by friends. They were soooo wonderful! We ate it up faster than I thought possible. I made the slices a bit long, or thin or something, and ended up with a more complex braid - should have gone back to look at the photos. It was still beautiful and yummy, but next time I'll stick with the original way since I like the looks a bit better. I also made more of the cream cheese filling and was glad I did so, it is so tasty! This was not a particularly tricky recipe for a novice like me, yet the results were amazing. Thank you for sharing this, and thanks to the one who shared the apple version as well! I always have a problem with berry/lemon fillings - under filling layer my dough became soggy, "wet" and I want that down part of my dough will be fluffy and good baked. . How it's possible to solve this problem? Instead of very expensive and rare blueberry , I put thawed and cooked black currants. 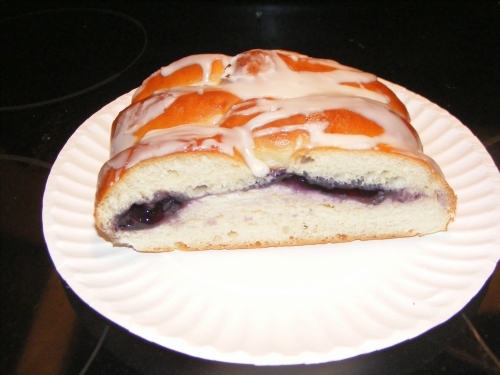 Raspberry, blueberry cream cheese bread - GREAT RECIPE! I finally got up the nerve to try this recipe and to my surprise, was not difficult. I had this batch of dough on the go when Floyd posted his raspberry version. As raspberries and blueberries are my favourite field berries and are (almost) always in my fridge, I used a half and half mix of berries. HEAVEN! The only problem I have with this recipe is I can't stop eating the stuff . . . I rolled the dough out thinner than the recommended 1 cm, but it didn't hurt the final result. Great recipe! I will now have to try some of the many fine variations in this thread. Thanks for sharing! 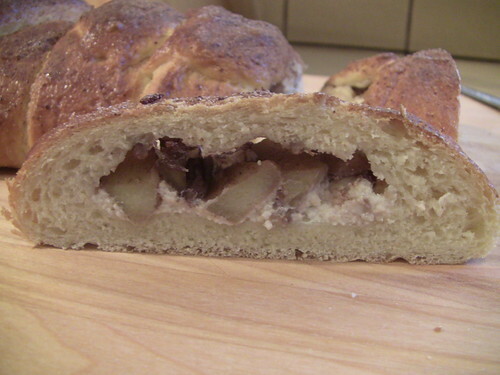 Hello.....I am visiting family in Germany and baking an apple/cream cheese braid as a Sunday treat. And the braids are looking good despite the baker's fast conversion to the metric system. It has been said many times, but thank you for this wonderful recipe. Hi all, here goes my blog on this filled and pleated bread. I meet on Fridays with a group to knit....I think I'll be making this for the next get-together! Thanks again! Has anyone ever attempted this as a sourdough braid? I am giving it a shot this morning as I have made this a number of times as is and we really enjoyed it. I will take pictures of the finished products. Has anyone froze these? How do they proof if so? I made this bread, but used all of the filling for this bread because I wasn't sure if it was supposed to be halved but when I laid it all out on the dough it looked to be the right amount. This braided bread turned out amazing! I wasn't sure about the fruit filling because the only liquid in the mix was lemon juice, it got really thick, but turned out perfect. Not too sweet either. I am going to use the other batch of dough for a ham and cheese braid later in the week. Is it supposed to be 1 tablespoon of yeast? That seems like an awful lot. Is that normal for this type of bread? Also, is the cream cheese serving as a moisture barrier for the bottom? If so, then I might try almond paste as an alternative like MiniOven suggested further up. I probably have some unless my hubby found it. One last question, can I omit the lemon juice or is it needed to help thicken the berries (like in jam)? I have a friend who is deathly allergic to all citrus. If not, I'll just use another filling. Thank you, time to get practicing for the holidays! Hi nice recipe any idea on conversion to sourdough?